The second generation TI-108 looks completely different to its predecessor, please focus on the position of the solar cells and the size of the display frame. Actually the calculator is around 0.2" (6 mm) smaller. We know a very similar calculator with the TI-1105. Dismantling this TI-108 manufactured in August 1988 by Inventec Corporation in Taiwan reveals a pretty simple internal construction. 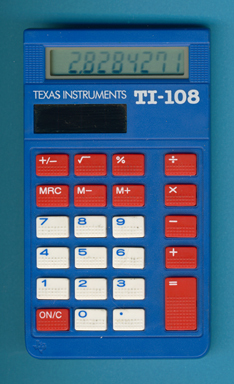 Since 1992 the TI-108 is using smaller solar cells but the design changes are barely noticeable. Please find a detailed overview of the different hardware versions of the TI-108 calculators between 1988 and 2016 here. Stokes Publishing Company, Inc. based in Sunnyvale, California sold a companion for the teacher, view the Basic. © Joerg Woerner, February 18, 2012. No reprints without written permission.